The historic Hedemora Theater Barn is the oldest buildning of is kind in Sweden. It was built in the 1820´s by a wholesale dealer, who needed a warehouse for his products. He decided to add a theatre hall in the attic floor of the building. The need for a theatre in Hedemora originates from the annual market in February – one of the largest in central Sweden throughout the nineteenth century. The theatre performances were always lively and amusing, but the spectators must have brought special ”refreshments in order to keep warm in February as there were no other heating facilities in the building. The attic hall was used as a theatre between 1829 and 1888 with the performances being no doubt of varying quality. From 1888 to 1910 the hall was taken over by the Salvation Army, who changed the apperarance of the hall considerably. After 1910 the building was a warehouse. When Hedemora planned for the celebration of its 500-year anniversary, a committee was formed for the restoration of the theatre hall. The Industrialist Axel Axelsson Johnson donated a considerable sum of moeny and the restoration was realized. Professor Agne Beijer, manger of the Drottningholm theatre in Stockholm, was in charge of the restoration work.Parts of the original framework in the theatre hall were intact; the colour of wall paper and painted walls could be traced although most of the interior had to be reconstructed and renewed. Advice and assistance was rendered by the royal opera and the royal castle in Stockholm.The restored theater hall has maintained the charm and cul-ture of the nineteenth century. On June 20 1946, the hall was reopened in the presence of the the Swedish crown prince and princess – later King Gustaf VI Adolf and Queen Louise. The restored theatre barn has served mainly as a museum. 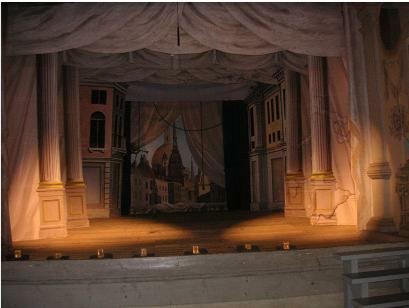 However, since the summer of 1991 teatre performances have been staged in the upper hall by local amateur players. An exhibition was opened 1993 in a ground floor room commemorating provincial theatre history in Sweden including the life and work of the famous actor and director August Lindberg (1846-1916), who was born in Hedemora.